Michel Montignac was the first health expert to recommend the use of the glycemic index for weight management. The Montignac Method is based on the principle of consuming low glycemic index carbohydrates. It especially emphasizes very low GI carbs, which has the effect of reducing high blood sugar and insulin levels. Ultimately this results in weight loss and beneficial health outcomes. The Montignac Method does not require you to limit the amount of food you eat. You will select food based on its nutritional value and potential to keep your body healthy and at its ideal weight. The best carbohydrates are those with the lowest glycemic index. The highest quality fats are the ones high in omega 3 and monounsaturated fatty acids. This includes fish and olive oil. Saturated fats such as butter and fatty meats should be avoided. Proteins should be selected based on how they affect insulin metabolism. The Montignac Method consists of two phases. The primary goal during this phase is to choose carbohydrates with a glycemic index of 50 or below. The purpose of this is to ensure that you eat meals that do not provoke increased blood sugar levels. Choosing your foods wisely prevents your body from accumulating fat and activates burning of your stored fats for energy. If you have less than ten pounds to lose you should stay in phase I for at least three months. This is necessary to give enough time for your metabolism to be restored. If you have more weight to lose it is recommended to stay in phase I for a month after you reach your goal weight. You will continue to choose carbohydrates based on their glycemic index. However in this phase you have a greater variety of choice. You can even eat whatever carbohydrates you want – even those with high glycemic indexes – by applying a new concept called the glycemic outcome. This involves taking into account the glycemic index, carbohydrate content, and the degree to which blood sugar levels rise after the meal. With the Montignac Diet Method you can select from two different kinds of meals: either a lipid-protein or a carb-protein meal. A lipid-protein meal means to combine proteins and fats. In this meal you can only consume carbohydrates that have a glycemic index of 35 or lower. Carb-protein meals largely consist of carbohydrates with a glycemic index between 35 to 50. In this meal you should avoid fats with the exception of omega 3 fats from fish or very small portions of monounsaturated fats. You should wait at least two hours after a carbohydrate meal before consuming a meal containing fat. Some of the foods recommended with Montignac. Trout, sea bass, salmon, ham, steak, chicken, eggs, soya yogurt, fat free cottage cheese, lentils, Montignac integral bread, oatmeal, basmati rice, almonds, walnuts, grapefruit, oranges, apple, pear, dandelion greens, cabbage, artichoke, spinach, zucchini, beetroot, dark chocolate, olive oil. 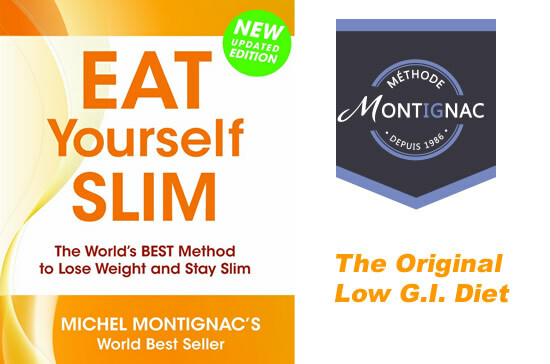 The Montignac Method is outlined in several books including Eat Yourself Slim: The World’s Best Method to Lose Weight and Stay Slim. These generally cost around $10-20. Does not require calorie counting or measuring food intake. Does not exclude any food category. Promotes a healthy lifestyle approach to weight control. May assist with the management of blood glucose disorders and cardiovascular disease. Website offers an easy-to-use tool for checking glycemic indexes of common foods. Some dieters may experience digestive discomfort as they adjust to a higher intake of fiber. The first phase requires avoidance of all foods with a glycemic index over 50. Meals must be carefully created based on their composition of protein, fat and carbohydrates. Weight loss may occur at a fairly slow rate. Does not offer exercise recommendations. The Montignac Method is a diet designed to support healthy weight management by choosing foods with a low glycemic index. This approach will assist with the regulation of blood sugar and insulin levels, which generally results in weight loss. However, dieters will need to be aware of portion sizes in order to achieve long-term success on this program.